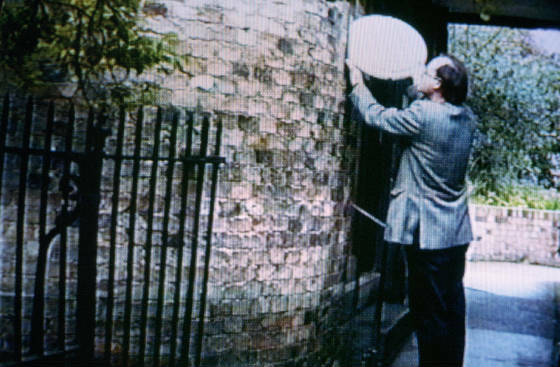 In the summer of 1998 Anne Eggebert and Julian Walker were invited to propose a site-specific work for Kettle’s Yard, Cambridge. Kettle’s Yard is ‘a beautiful and unique house containing a distinctive collection of modern art. Kettle's Yard was founded by H.S. 'Jim' Ede as a place where visitors would 'find a home and a welcome, a refuge of peace and order...' The house museum contains a closed collection of 20th century art, antiques, and found objects. It was developed by Jim Ede with the idea that ‘art [is] better approached in the intimate surroundings of a home’. The house at Kettle's Yard is the former home of Jim Ede and his wife, Helen, and contains a substantial collection of 20th century artworks displayed alongside furniture and other objects in the unique setting that Jim created. Jim Ede's idea was 'that art [is] better approached in the intimate surroundings of a home'. 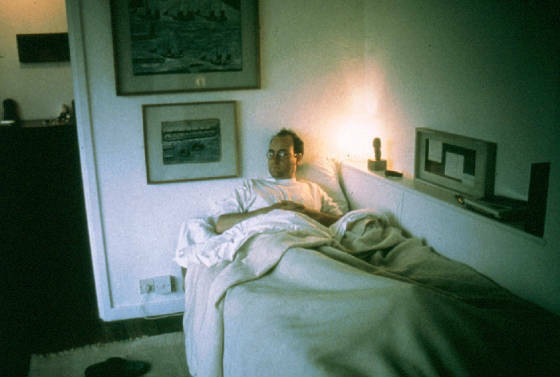 Kettle's Yard is designed as 'a refuge of peace and order', an act and site of spiritual contemplation. It is proposed as a model for English domestic settings/interior design which 'could be anywhere and for some reason it isn't'. "We recognised that Kettle's Yard offers a cultural model for the perfect living space that we desire. However, we are aware that this environment which is proposed as something natural is a tightly constructed English aesthetic. We considered the ambivalence of the delight of being in the space alongside the oppressive care of negotiating our way amongst the objects"
We decided that the best way to test Ede's idea of Kettle's Yard as a domestic living space and not a museum was to move in as a family. On the 16th June we invited guests to visit us and our 2 year old son in our new home. We installed CCTV cameras around the house, including its bedrooms, the cameras relaying images of our activities to a monitor facing the street. Members of the public were able to witness us greeting visitors to our new home and trying to maintain our domestic lives in the restrictive space of the museum. While we were there we performed ourselves as artists, installing and making new works/events/documentation in response to the site, and engaging in discussion about the project and implications of the work. The work Mr & Mrs Walker have moved comprised our living in the site for a week. 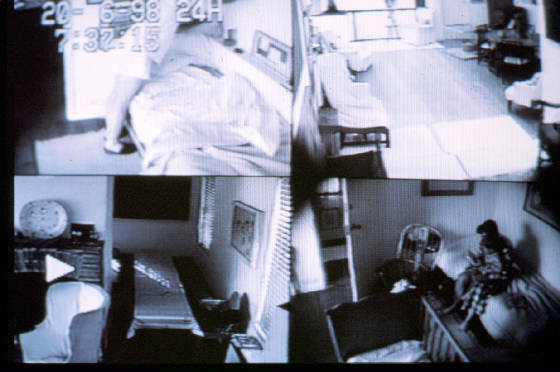 Domestic activities were carried out in the public view, either seen directly by visitors to the House, or from the street through closed circuit surveillance directed at the bedrooms, the eating area and the playpen, shown on a monitor in the window of the gallery space. Our overnight stay could be watched throughout the night. Works created during the period of Mr & Mrs Walker have moved included a sound work exploring the interconnecting space between Jim's and Helen's bedrooms; a time-based work involving the redecoration of Helen Ede's bathroom using an artist's palette and brushes; I Should Like To Live For Ever, a performance work examining the desire for self-validation through attempting to donate objects to closed collections.